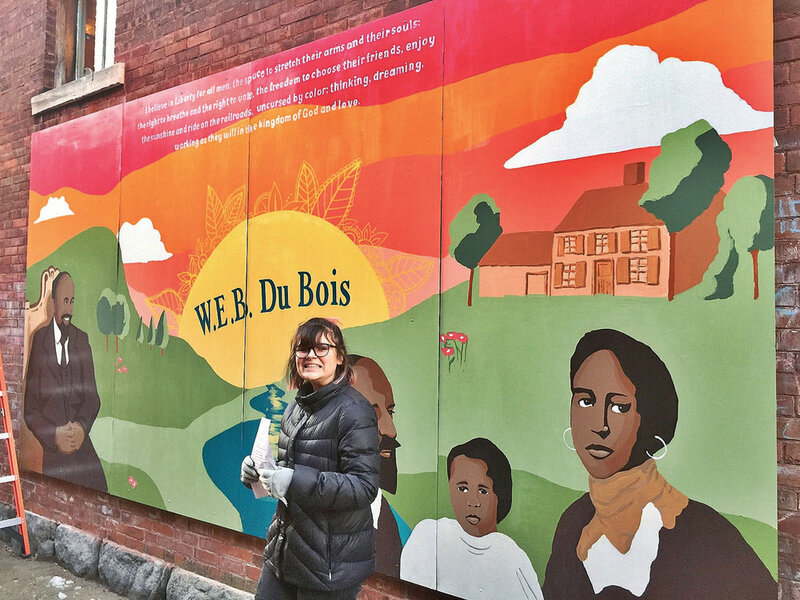 Unveiled in the first week of a festival lead-up to what will be Du Bois' 150th birthday on Feb. 23, the mural in the alley between Railroad Street and the Triplex Cinema parking lot has had lots of supporters and help. Triplex owner Richard Stanley has previously said he is thrilled to host the mural on the alley building, which he also owns. 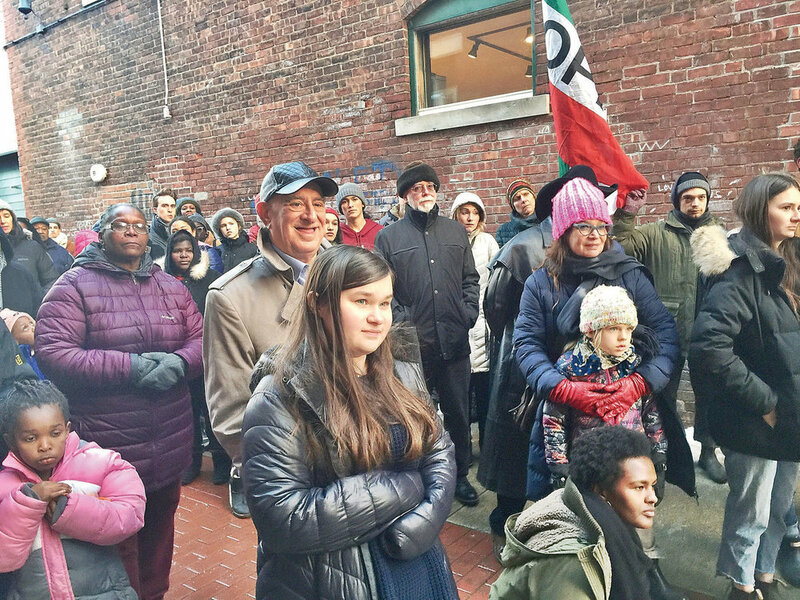 The group has also created several more murals honoring Du Bois, set to go up this spring on the Triplex building and in the alley near Rubi's Cafe, on a building owned by Erik Bruun, a founding board member of the Youth Project. 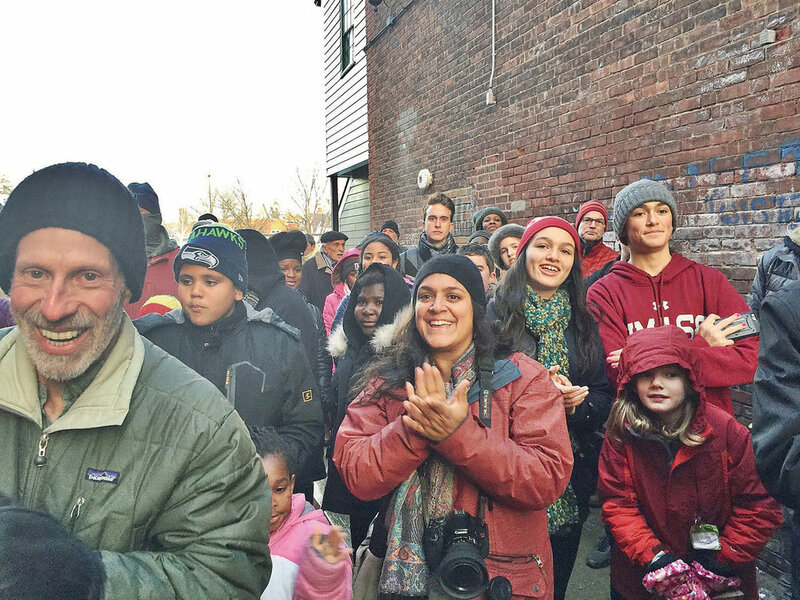 "It happened," said a jubilant Ananda Timpane, executive director of the youth project, after the unveiling, referring to a number of obstacles, stops and starts to get murals up on private property downtown. Hampton-VanSant, who also built the DuBois150th.com website for Du Bois resources and ongoing events, said he was fortunate to have been involved in the creation of the mural. "I've lived here 27 years, and being a black resident of this community, that this is physically in the downtown, and will be up here for a very long while will remind people of something,"
That something has overcome decades where Du Bois' legacy in the town where he was born was minimized due to controversies born from a long life spent tangling with the status quo of race relations and other injustices in American society. Elizabeth Blackshine came with family and friends from Albany to attend what she called a "historic event." Blackshine is a co-founder of Harmony Homestead & Wholeness, a newly formed organization working for racial harmony and peace. The group will hold a prayer vigil on Feb. 18 in Hillsdale, N.Y. as part of the 150th celebration. After the unveiling, the crowd moved into the Triplex Cinema, where students who participated in a Du Bois writing program either recited Du Bois' own work or their own, inspired by him. "There's a lot of history that needs to be reflected on — young activists are the voices of the future," said Alfred "A.J." Enchell, Jr., who is district aide for state Sen. Adam Hinds, D-Pittsfield. Both Enchell and Hampton-VanSant introduced the speakers at "Young Voices on Du Bois." Monument Senior Tristan Alston recited Du Bois' poem, "Song of the Smoke:"
I am wringing worlds awry ..."
Solomon Bennett, a senior at Berkshire Waldorf High School spoke of his own grappling with the immense struggle required to make social, economic and political changes. "I should like to be a hero though I know not where to begin," he said. But by the end, Bennett is finding his way, Du Bois-style. "I realize I shouldn't like to be a hero, for I should like to be a person. I should like to be a person just as everyone else. I see now that being human is heroic. We need no knight in shining armor to fix our problems — only we ourselves can do that. Older Post"Believing in Life: The Enduring Influecne of W.E.B. Du Bois"